The 2017 community musical Chitty Chitty Bang Bang is on this month! 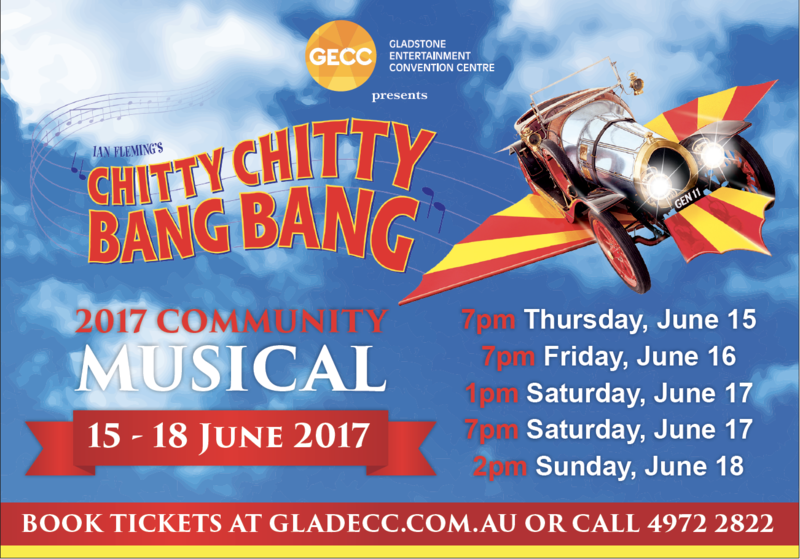 06 Jun The 2017 community musical Chitty Chitty Bang Bang is on this month! If you didn’t know that the 2017 community musical is on this month (15 – 18 June) then you do now! After meeting the cast of this awesome show we are willing to call it THE SHOW OF THE YEAR! What we love is the local cast that has been rehearsing day and night to put on this show for Gladstone. GN reporter met with show choreographer Donna for an insight into her role in Chitty Chitty Bang Bang show. As the main choreographer, how have you come up with the routines? The routines are inspired by listening to the music itself and making sure it matches the era. Chitty is such a classic it is so important for me to match the dancing to that period. We hear you love the Chitty story – what do you love about it? What’s not to love? I love the fact that it’s straight from the children’s imagination. It is a long-running magical show. You did lots of research to come up with the dance part of the show what inspired you about this show? After studying musical theater at WAAOPA, Western Australian Academy of Performing Arts, the opportunity came up so I grabbed it with both hands and ran with it. A local cast – how have you found working with so many diverse locals? The audition process was very hectic, we have some amazing local talent. The cast has been amazing. They are all very good and so dedicated. There is a range of dancing skills over the 54 cast members but everyone is dancing. It’s so much fun. Why not! Support our local talent. Chitty is a great family friendly show so come along and enjoy a great family night out. What’s a secret thing you know about the show that we’d all love to know about behind the scenes? The audience probably won’t realise that we have 2 different casts members for 2 of our main characters but you will never notice. We have shared lots of giggles, lots of fun it really is just a great show.